Tamdhu, like so many of the distilleries founded in the late 1800’s, has a rather up and down history. Founded in 1896 by a group of no less than 15 blenders and merchants led by William Grant, Tamdhu was designed by the hot distillery architect of the day, Charles Doig. A couple of years later, ownership switched to Highland Distillers, which continued to employ many of the original partners. At the time it was considered a very modern distillery, but that didn’t stop it from being closed 14 years later in 1911. It re-opened again in 1913 until the Depression reached its gates in 1928 and closed it once again. Tamdhu stayed closed this time for 20 years, re-opening in 1948. From 1948 on, Tamdhu chugged along nicely, expanding as needed to service the blended whiskies of Highland Distillers, and releasing the occasional single malt expression once single malt expressions became something distilleries released. In 2009, The Edrington Group, who had taken over Highland Distillers in 1999, mothballed Tamdhu. Luckily the doors didn’t stay shut for long. In 2011, Ian Macleod Distillers purchased the distillery and all maturing stocks. As it did after purchasing Glengoyne in 2003, Ian Macleod set about re-booting the Tamdhu brand. Interestingly (and sadly), the new owners decided to not use the in-house maltings. Up until its 2009 mothballing, Tamdhu was one of the few remaining distilleries to malt their entire requirement of barley on site. It also produced the unpeated malt for Highland Park. Presumably, the new owners found it more cost-effective to use an outside malt producer, but it is a shame. While any “distillery character” from in-house maltings may be too slight to even notice in a final product, I can’t help but think that with this homogenization, with all the Scotch distilleries using the same few malting companies, something is lost. The biggest change made by the new owners was to re-position Tamdhu as a sherried malt, with all maturation done in ex-sherry casks. With the endless supply of relatively inexpensive ex-bourbon casks flowing out of the U.S., most distilleries have turned away a bit from using ex-sherry casks, so it’s good to see a single malt brand deliberately returning to that style. 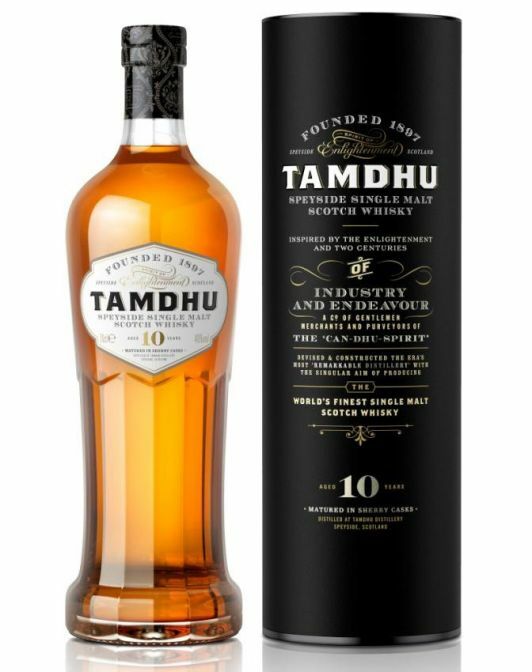 The Tamdhu 10 Year Old is their flagship/entry-level expression, with both first and second-fill sherry casks used for aging. The Nose: A nice, gentle, sweet, slightly perfumed nose. Malty, milky caramel and bruised apples mingle with quite a bit of vanilla-heavy orgeat syrup. Rice pudding with raisins adds another layer of sweetness with a touch of burnt milk funkiness. Subtler notes of dried red fruits, cherries maybe, cinnamon, and polished oak hang in the background. The Palate: Like the nose, the palate begins gently with a slightly oily, lush mouthfeel and much of the same sweetness carrying over. The caramel and apple are joined by more zippy orange citrus. Very dark chocolate and salted almonds lend a nice counterpoint. A nice, lingering development towards the end brings out dark chocolate-covered cherries, vanilla bean, tannic sawn oak, soft fine-ground pepper, and powdered cinnamon. The Finish: Lengthy and just a touch hot with that nice resurgence of dark fruit, more nutty vanilla syrup, and a nice tannic swell of oak at the very last. Thoughts: A very good “entry-level” young Speysider. I’ve tried this several times over the last year, and I continue to be impressed. It is sweetly complex with a nice progression and balance. While not what I would call heavily sherried, the sherry cask influence is subtly present throughout. It’s youth is evident in slight funkiness of the nose and heat towards the end, but overall, I think this one belies its age a bit. Really, my main quibble with the new Tamdhu 10 is its ~$60 price tag. I understand the implied cost of full sherry cask maturation, and perhaps more importantly, the new owner’s need to bring in some cash, but it still feels a little over-priced to me. On the other hand, I’m certainly glad the new owners just didn’t trot out some younger, no-age-statement malt, and that their plans include older expressions down the road. I think that and the quality of this expression makes Tamdhu a distillery worth paying attention to. Recommended. A few years ago, there was a different Tamdhu 10 on the shelves in our area. It was ridiculously cheap (mid $20s I think), and from what I remember, ridiculously awful too. We called it TamDon’t. Since you seem like a trustworthy fellow with above average taste, I need to revist this. As always, great write up! Real estate investments are tricky. Would you settle for a short term lease to see if I’m a bridge owing kind of guy? Nope, full amount in advance, cash only. I promise, you’ll love it. While I would love to plop down the dinero on what sounds like the steal of the century (literally), I’m a wee bit on the over committed side these days when it comes to long term capital investments. I’m sure you can relate. What I need is greater liquidity. In my glass preferably. If it’s any consolation, my 10 and 6 year old investments aren’t investments at all. More like money pits. Where is Shelley Long when you need her?